Leave it to Asheville to introduce the zipline to Minor League Baseball. Beginning on Opening Day, the Asheville Tourists, in conjunction with Wildwater 's Asheville Zipline Canopy Adventures, will deliver the game ball via zipline. 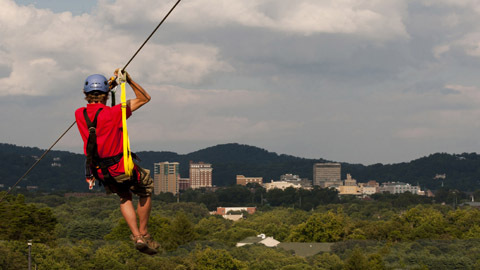 Beginning nearly 500 feet from home plate, a guide from the Asheville-based zipline company and one lucky fan will fly 30 feet above the field, from the grounds of Memorial Stadium to the heart of McCormick Field, just prior to the announcement of "Play ball!" "Coming to the ballpark is centered on entertainment and having fun," said Tourists president Brian DeWine. "We felt there was no better way to achieve that goal than to combine two of Asheville's favorite activities in baseball and ziplining. We're thrilled to be working with a group like Asheville Zipline Canopy Adventures and believe it will be a unique experience, particularly as it pertains to Minor League Baseball." Throughout the season fans will be able to register for drawings to win the coveted spots to deliver the game ball via zipline, which will take place prior to all 70 Tourists home games in 2012. "We at Wildwater's Asheville Zipline Canopy Adventures are as excited as participants will be about zipping into historic McCormick Field," said owner Jeff Greiner, of Asheville. "It's a place where history has been made many times before and this presentation of the game ball will be no exception. In fact, it will be the first ever zipline into a professional sports arena, which will be a home run for both the Asheville Tourists and fans." Asheville Zipline Canopy Adventures is located adjacent to the Crowne Plaza Resort near downtown Asheville and combines flying through 150-year-old white oaks with views of mountain vistas and the Asheville skyline. It is part of the Wildwater family of outdoor adventure centers, which includes four other zipline canopy tours as well as whitewater rafting in the Blue Ridge and Great Smoky mountains. The Tourists open their home slate on Thursday, April 5, against the Delmarva Shorebirds. After a four-game series versus the Shorebirds, the Tourists then welcome the West Virginia Power to McCormick Field for a three-game set, from April 9-11. The home schedule features 12 Thirsty Thursdays and 11 games each on Friday and Saturday evenings and Sunday afternoons. Also on the slate is a July 4th Fireworks contest against the Augusta Green Jackets; those tickets will go on sale after the start of the season. For more information, contact the Tourists front office at (828) 258-0428. More about Wildwater: Established in 1971 as the first outfitter in the Southeast, family-owned Wildwater added zipline canopy tours in 2009, and today boasts 59 total ziplines, 26 sky bridges, six zipline towers, and 41 tree-based platforms with 21,200 total feet of ziplines. The canopy tour arm of the business is headquartered in Asheville and is one of the largest owner/operator canopy tour companies in the country.